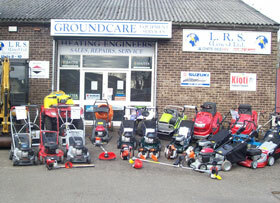 LRS (Lincs) Ltd has an extensive garden machinery range in our showroom, that includes lawnmowers, brushcutters, blowers, chainsaws, hedgecutters and scarifiers, the newer range is the battery operated equipment equipment. The knowledge we have gained over the years ensure that we can offer our customers good quality, reliable, and value for money products. Our customers range from domestic to commercial, each and every customer is treated equally, and the service we provide can be tailored to their individual needs on a regular basic. Our experience means we can cover a vast range of equipment, from sales, servicing or supplying spare parts. Our aim is to provide a first class service to ensure, wherever possible, that our customers are up and running with minimum delay, with the best possible service at all times. For further information about the company or any of the listed products please contact us.